Bruce Springsteen inducted U2 into the Rock'n'Roll Hall of Fame last night - then joined them on stage. Paying a generous and humorous tribute to the band in his induction speech, Springsteen described U2 as "keepers of some of the most beautiful sonic architecture in the rock-and-roll world". of The Who and remembered "the young Bono, single-handedly pioneering the Irish mullet. U2 hungered for it all and built a sound, and they wrote the songs that demanded it." In a moving ten minute tribute, full of warmth as well as wit, Springsteen said that U2 were "both a step forward for rock and a direct descendant of the great bands who believed if they played their best they could bring out the best in you." "Unos, dos, tres, catorce," he said, quoting the count-down at the beginning of 'Vertigo'. "That translates as 1,2,3,14. That is the correct math for a rock'n'roll band." A packed audience of 1500 for the 20th annual ceremony of the Rock'n' Roll Hall of Fame at New York's Waldorf Astoria hotel also saw the induction of The Pretenders led by Chrissie Hynde, soul veterans Percy Sledge and The O'Jays as well as blues-guitar great Buddy Guy. The ceremony, which began at 7pm, was still cooking at midnight. According to our insider at the show, it turned into a unique meeting of the rock'n'roll tribe with celebrated musicians from Eric Clapton, Rod Stewart and Robbie Robertson mingling with the Hollywood A-list like Catherine Zeta-Jones and Richard Gere. There's Edge talking to Eric Clapton. And that's Bono hanging with Bruce and Robbie Robertson. And U2 were also on form, in words and music. No sooner had they been inducted than Bono, Edge, Larry and Adam all took the microphone with emotional speeches, recognising that their success over a quarter of a century left them in debt to many other people. 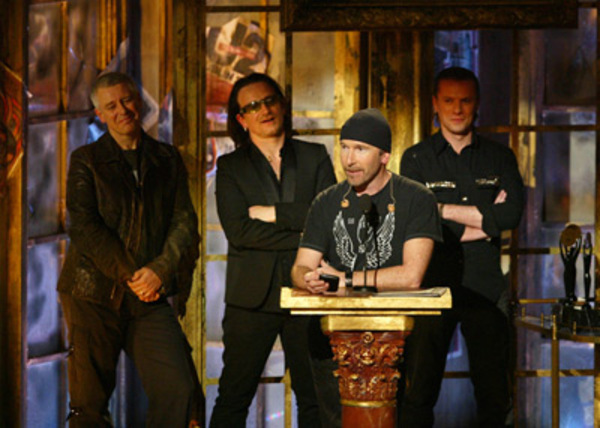 Bono remembered seminal moments in the band's past, from a 1976 practice session in Larry's kitchen, to a 1982 show in New Haven, Connecticut when Edge tried to break his nose, to a 1987 incident in the American south, when they received death threats for supporting moves to make Rev. Martin Luther King's birthday a national holiday. Larry promised that U2 were only now getting into their stride - later telling reporters that the induction was maybe ten years too soon and he wasn't quite ready for "institutionalisation". Also looking forward was Adam - to 25 years time when the hip hop community would be being inducted into the Hall of Fame. your life. It changed our lives." And, with lots of U2 management people in the audience, the band took time to namecheck key individuals like Ann Louise Kelly, Sheila Roache and Ellen Darst for their part in the band's success. "This is a bit of an Irish wedding," Bono said. "Beautiful girls in beautiful frocks, fights in the bathroom, lawyers with bloody noses." The affinity between U2 and Springsteen was never more evident than when Springsteen strapped on his guitar and joined in the vocals as U2 performed 'I Still Haven't Found What I'm Looking For', one of a rapturously received set of songs. With Bono dancing into the audience and spraying champagne during 'Until the End of the World', they also played 'Pride' and finished with 'Vertigo'. As a special celebration of the Rock Hall's 20th birthday, Eric Clapton and the Band's Robbie Robertson flanked Bo Diddley and Jerry Lee Lewis joined in for 'Whole Lotta Shakin' Goin' On'. mention of Barbara Skydel, in his speech, another person who goes way back with U2. "When I started Premier Talent, the whole industry was fighting against rock'n'roll, and the question was, will it survive?," Barsalona said. "The rock'n' roll spirit can never be killed." More news and reports as we get them.